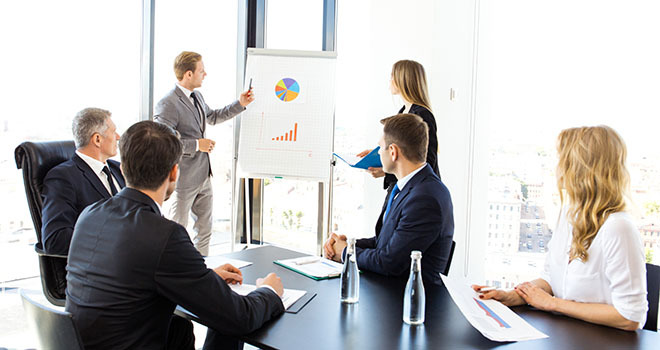 In the business world, many of our presentations are done in teams. During such a presentation, the audience’s eyes will fall upon everyone involved, not just the person speaking. Remember this: even when it’s not your turn to speak, you’re on. Therefore, any signs of disinterest or boredom by a team member will be easily noticed. Even innocent movements can send messages that you may not wish to send. Remember President George H.W. Bush checking his watch during the 1992 Presidential debate? That single act fueled a narrative about his supposed aloofness and disinterest. (1) If your presentation is longer than five minutes, have everyone on your team sit. Being seated will help guard again fidgeting. Sitting behind an appropriate table can help cover up nervous legs. Predetermine if team members will stand or remain seated when it’s their turn to speak. (2) Give your full and polite attention to the other speakers on your team. Take notes to keep you actively listening. Avoid negative body language, such as rolling eyes, crossed arms, or disdainful facial expression). (3) Project an attitude of interest toward audience members. Make eye contact with audience members and smile when appropriate. Sometimes, you need every advantage you can get. Following these simple tips will help ensure a smooth and more polished team presentation. Good luck!